Our professional injectors are some of the most experienced in South Florida. Are you mad? What’s wrong? If you’ve been hearing these questions lately, even when you feel just fine, a furrowed brow or squint could be to blame. When you start noticing lines on your face “at rest,” which means while having no facial expression, it’s the right time to start using an injectable to relax the muscles causing wrinkles on your forehead, lines between your eyes, or your crow’s feet. Injections of Botox, Dysport, and Xeomin prevent wrinkles from etching into your skin. The use of these products has been proven to take years off the age of your face, and they are very safe when administered by an experienced medical practitioner. Millions of Americans have benefited from Botox, Dysport, and Xeomin treatments to improve and prevent frown lines of the face, forehead lines, and crow’s feet around the eyes. Often wrinkles are creases that have been worn into the skin and subcutaneous tissue by making the same repeated expression over many years. The muscles causing these “expression lines” can be relaxed by blocking nerve impulses. Botox, Dysport, and Xeomin are neurotoxins, more specifically botulinum toxin type A, that can dramatically reduce the appearance of the toughest wrinkles. Injections of Botox, Dysport, and Xeomin into facial muscles block the chemicals that signal muscle contraction and relax the overlying skin and soft tissue. Results are generally seen anywhere from 2 to 7 days after injection and can last up to 4 months. With regular reapplication the results can last longer, especially if treatments are done before the muscles are allowed to return to full strength. Find out how Botox, Dysport, and Xeomin can smooth away wrinkles. Why Get Botox, Dysport and Xeomin at Ageless Medical? 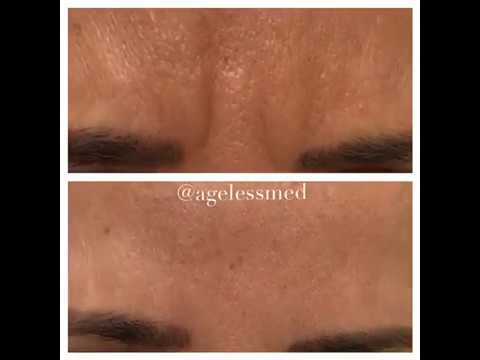 Medical Practitioner Erin Owoc, ARNP-C at Ageless Skin Medical has been administering injections since 2002. Because of the thousands of satisfied patients Erin has administered Botox to over the years, she was nominated as an Allergan National Trainer for Botox and Juvéderm. Additionally, Erin is a National Injector Trainer for Galderma, the makers of Dysport, Sculptra, and Restylane. As a National Trainer for these aesthetic manufacturers, Erin trains South Florida doctors and other medical practitioners on administering Allergan and Galderma’s anti-aging products. No hidden charges! We offer very competitive pricing on Botox, Dysport, and Xeomin. Ageless Medical does not charge for touch-ups within two weeks after treatment and does not charge extra for men. Some providers charge per unit and some charge per area. We sell Botox, Dysport, and Xeomin by the area, so you never have to guess how many units you need. We know how much product should be used and how to relax your wrinkles in the most effective manner with the appropriate amount and location of Botox, Dysport, and Xeomin. Because we charge by the area and provide complimentary touch-ups within two weeks following treatment, we would rather start by under-injecting and add more product if necessary. This means you can feel comfortable knowing that your Botox, Dysport, and Xeomin results will appear natural. Overdoing it is never our goal! There are several neurotoxins on the market, and Ageless Medical offers Botox, Dysport, and Xeomin. They are similar in the way they work, side effects, longevity, and effectiveness. Deciding on which one to use is up to you and your medical practitioner. Botox, Dysport, and Xeomin are used to relax the muscles that cause lines and wrinkles on the upper face. While Botox currently has more name recognition in the U.S., Dysport and Xeomin have been used successfully and safely in Europe for many years. All three products are excellent for treating forehead lines, crow’s feet, and lines between the eyes. There is not one “best” option when it comes to relaxing wrinkles. Each medication’s effectiveness can vary among patients, so finding the right neurotoxin that works best for you is our goal. Many of our patients report that Dysport’s effects are visible faster than with Botox or Xeomin. More important than which product you choose to minimize wrinkles is the choice of who will perform your injections. At Ageless Medical, we offer Botox, Dysport, and Xeomin, which means our medical practitioners provide a complete diagnostic approach to your injectables. How many years experience does your Botox, Dysport, and Xeomin medical provider have? Is the practitioner at the level of expertise of training other doctors and other medical practitioners? Is the provider a Platinum Provide of Botox? (Does she sell large amounts of Botox or does she rarely administer injections, which could impact expertise and the quality of the product)? Does the provider buy non-FDA approved Botox, Dysport, and Xeomin, and is the provider licensed to inject Botox, Dysport, and Xeomin? (Validate your provider by going to www.botoxcosmetic.com or www.dysportusa.com). Does the provider offer competitive pricing? Not only do we provide some of the most competitive Botox, Dysport, and Xeomin pricing in Broward and Dade counties, but we are also very experienced (injecting since 2002) and a Platinum South Florida provider. Watch Erin Owoc administer a Botox injection.